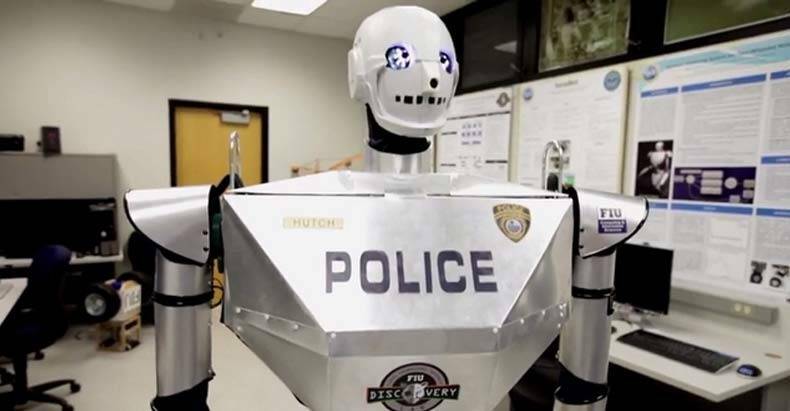 By 2016, there will likely be a 6-foot tall police robot patrolling the streets and handing out parking tickets. The Telebot, developed by Florida International University’s Discovery Lab, has been field-tested and is undergoing final tune up. With a swiveling head and dexterous fingers, the humanoid robot is controlled remotely by a person wearing an Oculus Rift headset and motion-tracking vest, arm bands, and gloves. The voice of the remote operator is transmitted through the robot to the unfortunate citizen on the receiving end. Justification for this (let’s just say it) Robocop, is couched in appeals to sympathy, to help disabled officers and veterans “get back on the job.” The reality is that it introduces another level of intimidation to the increasingly militarized police state and brings us one step closer to a dystopian future where autonomous robots carry out law enforcement. “As robots become more agile, we may see an increase of an armed robotic police presence. If a human police officer can get away with killing so easily, as The Free Thought Project continually documents, what would this mean for the robot officer? A fully autonomous robot officer is already in the works. The Knightscope K5 does not wield weapons but serves as a total surveillance machine for cops or private clients. It has facial recognition and scans 1,500 license plates per minute, captures audio and 360-degree video, tests the air for chemicals, and maps its surroundings with 3D radar and laser. It can learn to distinguish “suspicious activities” from normal activities. When the K5 puts all this data together and detects what it perceives as trouble, it alerts local authorities. 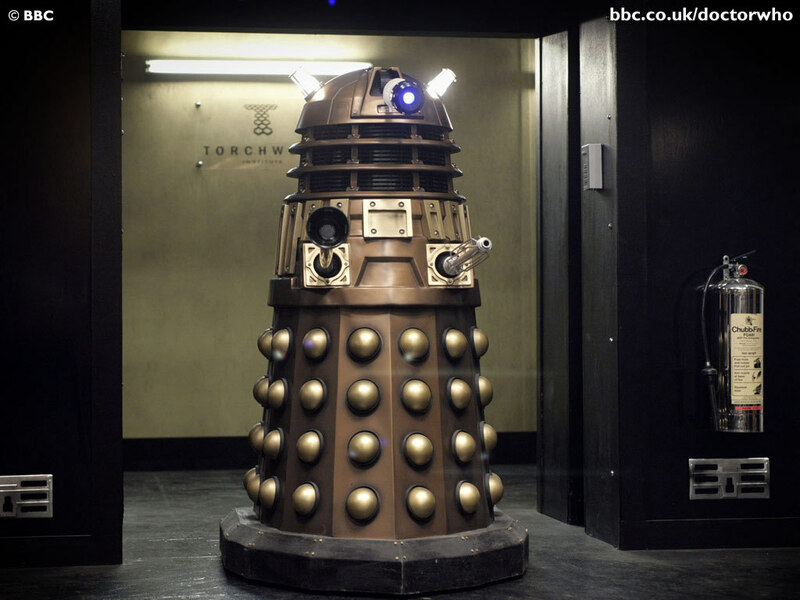 In a few years, this Dalek-like robot will be recording people’s actions and conversations in public places all over. Robots have been used for years to detonate or disable bombs. Nothing controversial there. But police robots are increasingly being developed for use against people. Large remote-controlled robots are now fitted with arms that can breach doors or hold live weapons. In a display of just how badly things can go, in 2011 a police robot burned down a mobile home after triple-warhead gas grenades were fired into the home instead of flameless grenades. The danger from police robots is not only ground-based. The Skunk Riot Control Copter is designed to “control unruly crowds” by firing up to 20 paintball or pepper spray rounds per minute from each of its four barrels. It also features strobe lights and lasers to dazzle the would-be protester, and, of course, the full range of surveillance capability to monitor the crowds. The militarization and robotization of police state USA is related to a Department of Defense (DoD) program starting in 1997 that transfers excess military equipment to police departments, to help them fight the immoral war on drugs. DoD has already given police more than $5.1 billion worth of military equipment. The Department of Homeland Security is part of the game too, giving grants to police departments for advanced tactical hardware to help fight those freedom-hating terrorists. Only, the government now treats its own citizens as terrorists. Peaceful protesters fill the lenses and microphones and crosshairs of robot police. Unfortunately for the citizens of Police State USA, this is no laughing matter.